Origin and 1st Appearance of Zatanna. 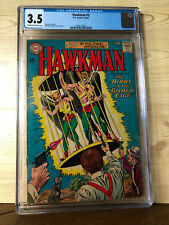 Hawkman #4 - CGC Graded. Hawkman #4. For your consideration is this Hawkman #4 graded comic book. This was just received from CGC. Only item pictured is included. 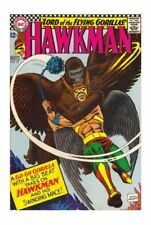 Listing is for a real nice presenting copy of Hawkman #4! Huge key issue with the 1st appearance of Zatanna! I would grade the book at good minus. Has wear on spine and a tear on front cover. Presents extremely well for the grade. Cover is detached at bottle staple but still attached (loosely) at top staple. Interior pages all attached at staples. Overall, a nice looking affordable copy! Will be shipped well packaged in a high grade Mylar bag with acid free board. Let me know if you have any questions and thanks for looking. Feature Story: Hawkman, Hawkgirl. Gardner Fox (Script), Murphy Anderson (Pencils), Murphy Anderson (Inks), ?. (Colors), ?. (Letters). cover Murphy Anderson. ------------------------------------------------ ------------ -------- - grade gd . The photos are of the actual items you will receive. Slab is the new and appears unblemished. I will promptly ship, well packaged and insured and boxed via USPS priority mail. I am a collector and value the condition you receive your item in as much as you do. I will combine shipping. International buyers please message me if you would like to discuss shipping direct instead of the global shipping program option. Please check out my other listings. I have several great silver through modern age items listed. Pictures taken at an angle to cut down on glare. Case is in perfect condition direct from CGC. A SOLID COPY OF DC COMICS' BRAVE AND THE BOLD #34. THIS KEY ISSUE FEATURES THE FIRST SILVER AGE (1961) APPEARANCE OF HAWKMAN, HAWKGIRL, AND BYTH! IT'S IN SOLID VERY GOOD PLUS TO FINE CONDITION. THIS ISSUE ALSO FEATURES ARTWORK BY SUPERSTAR ARTIST JOE KUBERT (RIP). Up for sale is an issue of HAWKMAN #1. 100% complete, EXCEPT FOR BACK COVER. Nice page quality. The book is dated 1964. No restoration. Hawkman #4 - CGC 5.0 VG/FN - DC 1964 - 1st App & ORIGIN of Zatanna!!! 1st Appearance and ORIGIN of Zatanna! Beautiful CGC 5.0 (VG/FN) example - Cream to Off-WhitePages with Excellent Gloss quality! Hawkman #4 DC 1964. -Great color. -No missing pages or cut-outs. -Both staples attached. Feature Story: Hawkman, Hawkgirl. Gardner Fox (Script), Murphy Anderson (Pencils), Murphy Anderson (Inks), ?. (Colors), ?. (Letters). cover Murphy Anderson ------------------. --from DC from 1965----- --- ------ -. And I have!". Over 40 years of experience in the comic book hobby. Regular dealers at northern east coast conventions. You can trust that you will be getting a quality product. 80,000 Comics Wide selection of comics, from golden to modern age, catering to all types of collectors. Hawkman #4 CGC 6.5 Off White Pages 1st Zatanna. - CGC bag replaced with a crystal clear mylar. Looks fantastic in these. All scans are of the actual comic book. Feature Story: Hawkman, Hawkgirl. Gardner Fox (Script), Murphy Anderson (Pencils), Murphy Anderson (Inks), ?. (Colors), ?. (Letters). cover Murphy Anderson. --from DC from 1966----- --- ------ -. (Sequence 1 - Story, 24 pages ). FIRST Hawkman Series Begins here. a KEY DC Universe book! Hawkman #1 in Mid-Grade (6.5 To 7.0) Condition, DC, 1964. The interior pages are free of crayon, marker, pen, pencil, stamp and all similar markings. MYSTERY IN SPACE #61 (DC 1960). KEY BOOK: Features the first appearance of ULTHOON. FINE (6.0)condition. This is a sound, higher grade copy of this magazine with bright color and excellent original gloss. Note:This is the 1st Adam Strange and Hawkman team-up. Classic cover. Title:MYSTERY IN SPACE. Publisher:DC Comics. It is never our intent to "rip" anyone off. But if you don't make us aware of the problem we can't fix it. Please review all photos carefully, for what you see is what you get. Please feel free to contact us with any questions regarding item or condition. ALL ITEMS SHIPPED IN A BOX, NEVER AN ENVELOPE. COMBINED SHIPPING AVAILABLE UPON REQUEST. INTERNATIONAL SHIPPING OFFERED THROUGH THE EBAY GLOBAL SHIPPING PROGRAM ONLY. COMBINED SHIPPING IS NOT AVAILABLE FOR INTERNATIONAL BUYERS. ALL REASONABLE OFFERS CONSIDERED. GRADES AND CONDITION INFORMATION ARE APPROXIMATE. PLEASE VIEW ALL PICTURES CAREFULLY. Origin and 1st appearance of Zatanna. Cover art by Murphy Anderson. Smoking is for Squares! The Girl Who Split in Two!, script by Gardner Fox, art by Murphy Anderson; Jan Kyll and his band of raiders travel from the year 11964 with a vehicle that emits magnetic rays to help them steal historical treasures. HAWKMAN #1. (1964 series). : HAWKMAN #1. (1964 series). 1st Printing ! Lots of great product at affordable prices! Lots more coming in the next few weeks. Check out the scan(s). Created when?. Berkbridge Foundation is a U.S. non-profit organization under IRS 501 (c) (3) with a primary mission to provide financial support to single mothers in child care related matters. 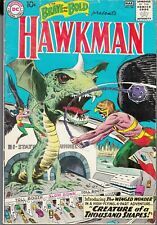 Hawkman #15 DC 1966 - NEAR MINT 9.4 NM - silver age, justice league, comics! Hawkman #15 DC 1966. Beautiful NEAR MINT 9.4 example - Off/White to White Pages with Excellent Gloss quality! Collectors Comics. Sandwiched between 2 pieces of thick cardboard for the best protection. Cover art by Murphy Anderson. Are You a Good Neighbor?. Secret of the Sizzling Sparklers! House ad for Superboy Annual (DC, 1964 series) #1. House ad for the "New Look" Batman; includes cover art from Batman (DC, 1949 series) #164 and Detective Comics (DC, 1928 series) #327 (first issues under new editor Julius Schwartz). Brave and the Bold # 47 1963. Strange Sports. MYSTERY IN SPACE #87 (DC Comics 1963) VG Featuring Hawkman and Adam Strange. Cover edge wear, browning, spine stress, clean inside with slight page yellowing. Hawkman #5 Silver Age DC near perfect NM- to NM 9.2 to 9.6 by my subjective grading estimate. No noticeable flaws. Origin and 1st Appearance of Chac. Hawkman #1 - CGC Graded. Hawkman #1. 1st Hawkman in his own title. For your consideration is this Hawkman #1 graded comic book. The plastic case is in new condition.